A Flemish-born artist with international court ties, Cornelis Gijsbrechts presented a virtual inventory of seventeenth-century symbols of transience in many of his still lifes. 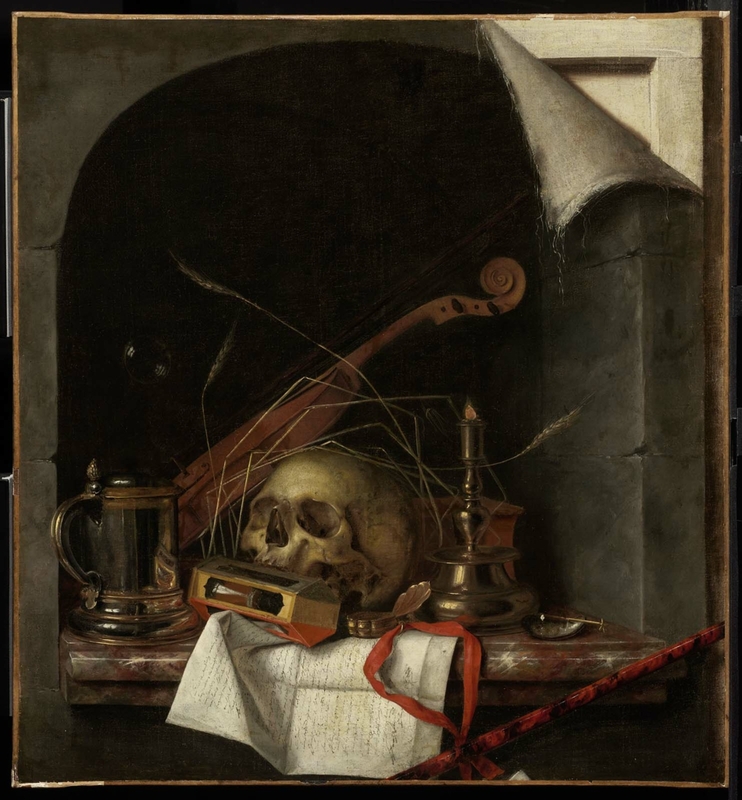 Vanitas motifs, like the skull, hourglass, candle, soap bubble, and music—represented here by the violin—served as reminders of the transitory nature of the material world. Whereas vanitas images appeared as compositional elements in other genres, these objects became the primary focus in this type of still life. The inclusion of such potent symbols in these compositions allowed the still-life genre to take on a moral significance. By painting the top right corner of the canvas as if it had come loose from its support, he demonstrated that even the painter’s canvas, which may appear to arrest time, is fragile and impermanent. In this way, the artist melded a visually striking trompe l’oeil technique—one intended to fool the eye with its illusionism—with the vanitas subject. According to Poul Gammelbo, "Cornelius Norbertus Gijsbrechts og Franciskus Gijsbrechts," Kunstmuseets Arsskrift, 1952-1955 (Copenhagen, 1956), p. 146, no. 15.